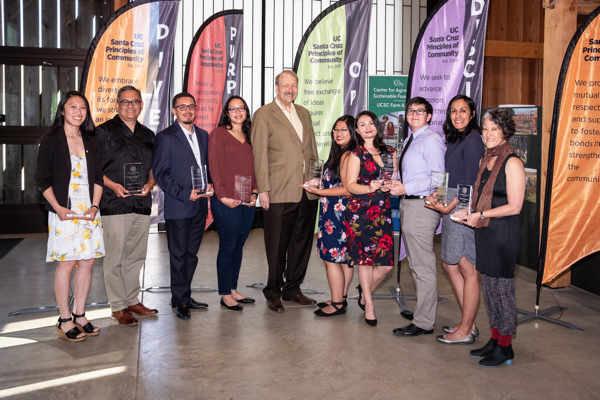 The 2018 Chancellor’s Achievement Awards for Diversity were presented May 29 during a reception at the Hay Barn. Before presenting the awards, Blumenthal noted that promoting understanding, taking the time to create a community that values differences, and recognizing the unique contributions of all people enriches UC Santa Cruz and its community. Karen Tei Yamashita is the author of Through the Arc of the Rain Forest, Brazil-Maru, Tropic of Orange, Circle K Cycles, I Hotel, Anime Wong: Fictions of Performance, and forthcoming, Letters to Memory, all published by Coffee House Press. I Hotel was selected as a finalist for the National Book Award and awarded the California Book Award, the American Book Award, the Asian/Pacific American Librarians Association Award, and the Association for Asian American Studies Book Award. She received a US Artists Ford Foundation Fellowship and is professor of literature and creative writing. Rebecca Covarrubias is an assistant professor in psychology. A social and cultural psychologist, her research focuses on identity, culture, health, and educational quality and access. Covarrubias served as a leader for the campus’s first generation initiative, which produces programming that supports first-generation students and raises awareness about their needs. She has been instrumental in identifying strategies that influence students’ likelihood to return from academic probation and to utilize campus resources to increase their opportunities for success. Dr. Pablo Reguerín is associate vice chancellor for student achievement and equity innovation, and director of the Educational Opportunity Programs. During his 19-year career at UC Santa Cruz, Reguerín has contributed to the educational success of hundreds of underrepresented students. 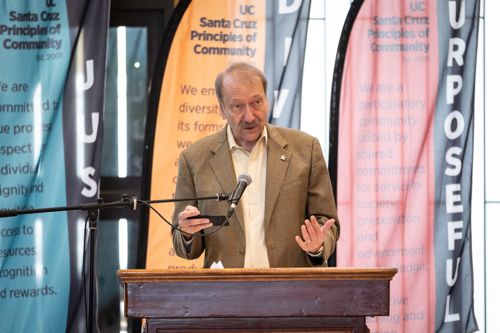 He was instrumental in winning Hispanic Serving Institution status for UCSC, and continues to spearhead HSI initiatives that work toward the recruitment and retention of Latinx students in the STEM fields. Reguerín, who holds a doctorate in educational leadership, also has been a leader in his support of undocumented students, and has educated the campus, UC system, and the Santa Cruz community about DACA and the needs of and opportunities available to undocumented students. Katherine Lê is Student Union Assembly Vice President of Diversity and Inclusion and a third-year undergraduate student studying politics, legal studies, and sociology. Lê’s commitment to diversity and inclusion is demonstrated through her advocacy efforts to have UC Santa Cruz designated as an Asian American and Native American Pacific Islander Serving Institution. Under her leadership, SUA re-established collaborative relationships with campus resource centers and student organizations and relaunched the Diversity Commission. She sits on the Academic Senate Committee for Affirmative Action and Diversity, helped plan the annual Martin Luther King Jr. Memorial Convocation and the First Gen Initiative Reception. Patrawat Samermit, a Ph.D. Candidate in cognitive psychology, is a founding member of the psychology department’s Diversity, Equity, and Inclusion Committee and is the programming chair for the Graduate Student Commons. Samermit has fostered a sense of community for graduate students. Furthermore, she has coordinated successful events focused on Asian American/Pacific Islander graduate students and student mental health. Through robust collaborations, she was instrumental in organizing and securing funding from multiple sources for graduate student diversity in teaching and pedagogy workshops. Juan Ruiz Cortes is a philosophy student working toward a master’s degree. He single-handedly was responsible for successfully bringing a Minorities and Philosophy (MAP) chapter to UC Santa Cruz. As a result of his efforts, students in philosophy are able to “exchange ideas on topics related to minorities and philosophy, meet and support peers, and examine and address issues of minority participation in academic philosophy." The MAP group’s first meeting was combined with the Philosophical Slug Society fall informational meeting which functioned to bring awareness of the importance of issues related to diversity in philosophy to other students. This pilot mentorship program for women-identified undergraduate students from underrepresented backgrounds is meant to build a community of support to provide professional development and generate a pipeline to graduate studies. The M.I.N.T. program has accomplished this by pairing graduate mentors with undergraduate mentees and supporting these pairs in an exploration of the possibilities for graduate studies and beyond. For the past two years, psychology and feminist studies graduate student Christine Rosales has served as the M.I.N.T program coordinator. Angela N. Brooks, an assistant professor in biomolecular engineering, is well-known in the scientific community for her work on RNA processing abnormalities associated with cancer and her commitment to inclusive excellence in the field. Brooks has enhanced diversity and inclusion in STEM by creating new training opportunities for students from underrepresented groups, collaborating with the UCSC Graduate Division to create a summer research training program for students from Southern University Baton Rouge, a historically black university, and leading and mentoring a highly diverse team of graduate and undergraduate student researchers.